Dorothy Orgill Kirsch has a simple rule about her wide-ranging volunteer work: it should be fun. 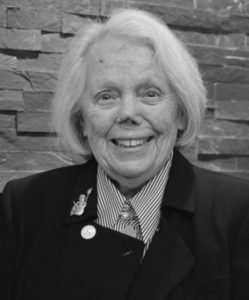 In more than 60 years of community service, Dorothy has become a model for how to fully engage in support of arts, animals, education, environment and youth to make our city better. Docent, board member, patron, advocate – Dorothy puts her heart and her self where her money is. She could be found at the Memphis Zoo teaching school kids in the Reptile House, financing talented newcomers with Ballet Memphis or sponsoring shows at Playhouse on the Square while leading applause from the audience. Caring, genuine, funny, energetic, loving, merry – Dorothy regularly brings groups of her close female friends to theater and ballet performances, arts fundraisers and other activities. Dorothy was born and raised in the city where she married and was widowed twice, raised two children and curries a bevy of friends and admirers. Kirsch’s father, Kenneth W. Orgill, was secretary in the family business, which opened in Memphis in 1847 and is still Memphis’ oldest running business. As a girl, Dorothy remembers “knitting thingamajigs” for World War II soldiers and volunteered at Calvary Episcopal Church and as a member of a high school sorority during her term at the Hutchison School. She majored in political science and minored in economics at Randolph Macon Women’s College in Virginia. Back in Memphis in 1955 after graduation, her second cousin Edmund Orgill (Memphis mayor 1956-1959) helped her get a job at what was then Southwestern at Memphis. She laughs now about being paid “$75 every two weeks or something” for helping the woman who produced an alumni newsletter and items about students for area newspapers. She soon met Thomas White, resigned her job the spring of 1956 and got married. But, shortly, the first in a series of tragedies struck. Her only sibling, Kenneth Orgill Jr., 33, who had been under psychiatric care for more than a year, had lunch with his parents, then drove downtown and jumped from the Memphis-Arkansas Bridge. It was the afternoon of Jan. 31, 1960. At about 8 p.m. 11 days later, his wife, Nancy Wilson Orgill, asked Dorothy and Tom White to babysit her young children. Later that night a 1955 Oldsmobile registered to Kenneth Orgill was found still running on the bridge. Nancy Orgill, 31, was missing. Her body was found in the Mississippi River near Scott, Miss in April; his was not recovered. Kenneth W. Orgill III, 5, and Elizabeth Orgill, 3, came to live with the Whites. Eight years later, Tom White was killed when the Piedmont airliner he was aboard collided with a small plane over North Carolina. He was 37. That launched a critical partnership between the Kirsches and the zoo. Bill Kirsch was zoo board president in 1987 and Dorothy joined the board and was the first board member to do weekly training classes to become a docent. Bill Kirsch died in 1989 after a brief illness. Dorothy’s “infectious enthusiasm” has continued to nourish the zoo and a long list of arts, schools and more. “I’m lucky enough to do the things I love,” she says. We – and her FIVE rescued dogs – are all lucky to live where Dorothy Kirsch steadfastly shares her time, energy and resources to make our community stronger. Dorothy Orgill Kirsch is our 2016 Woman of Achievement for Steadfastness.